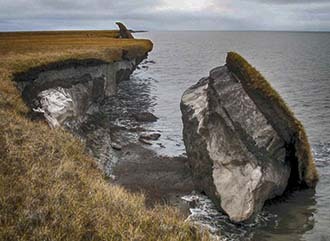 The Arctic Coastal Plain of northern Alaska is a complex landscape of lakes, streams, and wetlands scattered across low relief tundra that is underlain by permafrost. This region of the Arctic has experienced a warming trend over the past three decades, leading to thawing of on-shore permafrost and the disappearance of sea ice at an unprecedented rate. The loss of sea ice has increased ocean wave action, leading to higher rates of erosion and salt water inundation of coastal habitats. Warming temperatures have produced an earlier snowmelt, lake ice thaw, and plant growth. As a result, many migratory species now arrive in the Arctic several days earlier in spring than in the 1970s. Predicted warming trends for the future will continue to alter plant growth, ice thaw, and other basic landscape processes. Predicted warming trends for the future will continue to alter plant growth, ice thaw, and other basic landscape processes. 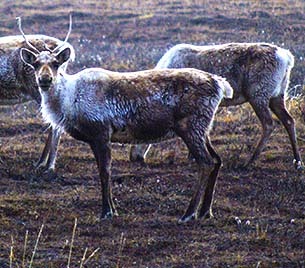 These changes will undoubtedly result in different responses by these caribou and other wildlife like (fish, birds, and mammals) and the food they rely upon (plants, invertebrates, and fish). However, the type of response by different wildlife populations and their habitats—either positively or negatively remains largely unknown.